Bongaigaon is one of the largest cities in Assam and serves as one of the key commercial and industrial hubs for the North East. Located about a five hour ride from Guwahati, we jumped on two vespas borrowed off a friend and began the dusty slog up the highway. The plan was to keep an eye out along the way for any interesting roadside craft work in action, as we were quite interested in having a closer look at some of Assam's cane and bamboo workmanship we had heard a lot about. We were about to dismiss the hunt as a futile endeavour that could need a little more conviction than our casual rubber necking around, when we nearly rode past a cane workshop set up on the side of the road. We pulled up and sat down for a chai break with the owner. The novelty of stumbling upon little nooks of craft being worked out in the open, by both family households and commercial shops such as this one, probably won't ever wear off. Craft in Australia has become a niche market, banished to the realm of high end catalogues where products wield proud 'one-off piece' statuses. This was one of the primary reasons we relocated to India, to find and bring the work of Karigars back into Australian life through our products and hope to encourage a greater accessibility to work which bears the markers hands. 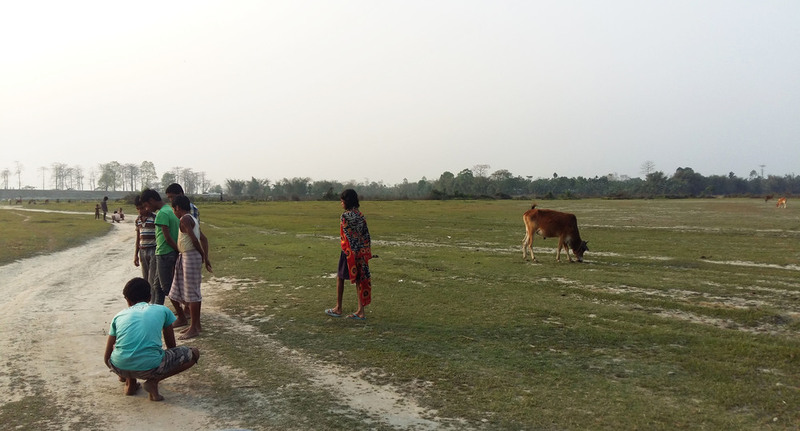 Five hours later we skirted the beginnings of the Bongaigaon township and pulled up at The Ant campus. 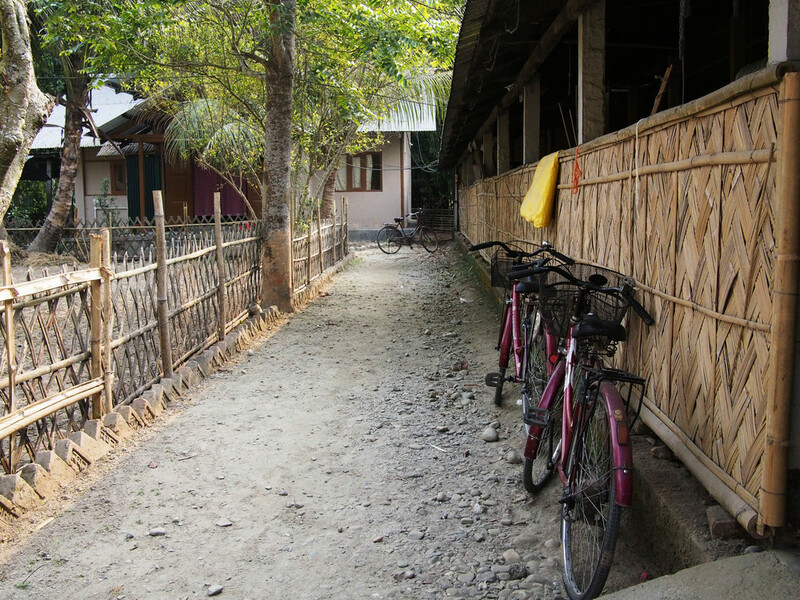 The Ant, or The Action North-East Trust is an NGO running a myriad of community development projects in the Chirang district (north Assam bordering with Bhutan). We barely scratched the surface of understanding the true extent of their work, however we got a personal insight into the operations of their affiliated organisation, Aagor. The Ant originally established Aagor as a trust for the poor and debt-stricken Bodo weavers of the Chirang district. The Bodos make up the largest tribal population of Assam and have spent decades leading a violent separatist movement for the division of their own state, Bodoland. This violence has taken its toll on the rural Bodo communities and forced many women to seek menial employment to feed their families. Bodo women learn to weave as children on the family loom, and so Aagor (which means design in the Bodo language) was formed in 2002 to engage the Bodo women's fine weaving skills as a means of employment. We were lucky enough to have our two day visit coincide with Aagor's monthly weaver meet up, which takes place in the central village market of Khusrabguri. We set out in the afternoon for Khusrabguri located 20km out in the rural farmland behind The Ant campus. The ride itself was a scenic off-road adventure, at one point crossing a toll bridge (5 rupees) fashioned entirely from thatched bamboo and propped up on precarious looking stilts. The rest of the ride wound through tranquil green foliage lined village roads before opening up into vast green fertile farmlands. We pulled up into an open grassy market square, bordered by an array of small shops. Off to one side was a gathering of brightly adorned women, in the process of folding and unfolding long yards of handloomed fabrics. The women had devised an effective measuring stick by stapling a measuring tape along the side of an auto, and were going through each woman's bag of fabric in turn. We stood by and watched whilst chatting to the Aagor rep as to how it all worked. At each monthly meet up, the Aagor reps handed the women the hanks of spun yarn for their weaves. The women produced the yards of fabric woven on their home looms over the previous month to be measured. The senior weavers of the group graded each weave on its quality and a price determined per metre accordingly, for which the women received payment at the end of the meet. This system benefited the women by giving them autonomy over their work; they decided their output and could balance it around their duties at home. If not for groups such as Aagor, the alternative for many of these women would be to move away from home and into one of the major cities such as Guwahati to work in a factory weaving. The ideallic setting of these villages as well as the balanced lifestyles this format of working creates makes the NGO an invaluable institution for these and many other women. For Aagor, the time spent to maintain the project was at a bare minimum, requiring only 4-5 hours per month for the meet up. Aagor also runs a handloom residency of sorts from The Ant campus, taking up to 20 women at a time to develop more contemporary design variations and further their skill sets. The weaves produced from this school as well as the village initiative retail from the ANTS concept store in Bangalore, providing the women with a client base reaching across India and internationally. As we rode back to town the feeling we were left with was a real sense of community. The women enjoyed the work they were doing and there was a jovial companionship between the women and the Aagor reps out in the village. The trip proved to be an invaluable experience seeing an organisation work effectively at the grass roots level with the weavers to produce a beautiful product.